There is a YouTube video making the rounds. It's called "Obama Slow-Jams the News". Perhaps you've seen it; thus far it has received over eight million views. It's a segment from the Tonight Show starring Jimmy Fallon, who begins speaking briefly about the president's accomplishments over the past eight years. He'd intended to make a joke about it but then changed his mind; it didn't need a joke; what it needed was to be slow-jammed. He asked the Roots' Tariq Trotter, who assented, if the record should be slow-jammed, and the curtain rose on their guest--President Obama. And the band began to play--softly, slowly, down-tempo. With Obama and Tariq fanned out behind Fallon, the focus on each in turn, Obama sing-songed the list of his accomplishments in office--you've heard it often enough, the optimistic assessments, the face-lifted facts, the occasional nugget of truth like a gnat in spider silk--summoning all those jobs (in which the discouraged who stop looking for jobs are folded into falling unemployment numbers), eradicating the recession (until comes the next bank failure, at which point people will, no volition required, 'bail-in' their bank accounts for parasites too protected to fail), conducting undeclared wars in seven countries and establishing forevermore anonymous assassination by drone (well, he didn't mention those). The litany was relieved by a focus on Fallon as he intoned, "Oh, yeah, president Obama stimulated long-term growth, in both the public, and the private, sector ..." Eyes sleepy, mouth to the mike as he swayed to the rhythm, Fallon did a fine impression, much of the audience standing, quivering with amusement and awe, unable to believe this, sharing the air with Obama. 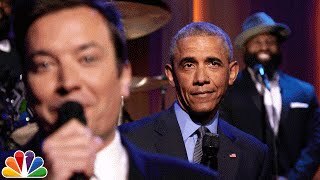 "In 2008," Fallon murmured, "the country wasn't feelin' in the mood; it was too tired and stressed; it said it had a headache ... Barack lit some candles and got some silky satin sheets ..."; Tariq crooned, "Silky satin sheets, now ...", the lazy beat zapped with finger snaps. Fallon: "He told the American people, yeesss, we can ..."; Tariq: "Yes, we can, and it's all right; he created tons of jobs for you and me ...", pause, "and he's got one left, for Hil-lar-y! "" Obama hit all of his sugar-spun accomplishments, his State of the Union redone in sing-song. And I, no admirer of the man, could smile along, enjoying the parody, letting the half-truths float by--until it went one plug too far. After seven years of darkness during which details of the so-called free-trade agreement were kept not only from the people but even from Congress (if not from Wikileaks), the text of the Trans-Pacific Partnership finally erupted like methane into infrared. As has been noted elsewhere, an authentic free-trade agreement need not be lengthy, primarily needing provisions to remove tariffs and eschew currency manipulations--practices that otherwise increase the cost of imports. But in the darkness the TPP ballooned into thousands of pages within which trade is barely glimpsed. Its greater aim is to consolidate legal rights of the non-patriated special interests that fashioned it, while leaving consumers effectively unclothed. Incidentally, perhaps, it will handicap the US, because the TPP neglects to address two issues that are crucial specifically to US global competition: Value-Added Taxes (VATs) and currency manipulation. Applied to imports at the point of entry, VATs are employed by every country in the TPP save Brunei, a tiny nation on the island of Borneo. And the US. Although TPP indeed cuts thousands of tariffs, VATs go unmentioned. The way TPP is written--and it cannot be renegotiated--this will act as a tax on US exports to other TPP countries. As to currency manipulation, the US doesn't do it but many other TPP countries do, and this too will give their products an advantage over US goods. One can only speculate as to the reasons for Obama and his highly touted trade negotiator allowing the US to be put to such needless disadvantages. But maybe these issues seem safely removed from your concerns. This won't be. TPP greatly expands the Investor State Dispute Settlement system. ISDS gives corporations the right to sue governments that have laws--environmental, policy, labor--that might impair their profits. Might is the operative word; in their suits they need not substantiate their claims of impaired profits but just assert them. These suits will be heard not in the court system but in a closed-door tribunal. Only private industry may sue through ISDS; state or citizen suits wend their ways through the court system. Governments trying to protect consumers or labor or environment will be engulfed in lengthy and expensive legal actions while corporations take their profits one way or the other. We've already had a taste of what's to come--note the TransCanada suit of Obama's administration over Keystone--but, as they say, you ain't seen nothing yet. If all 12 countries involved implement TPP, it will expand ISDS provisions from 20 percent of the world's economy to 90 percent. This will affect you. Any politician who backs TPP unaware of its contents is dangerously naive; any who with knowledge backs it should be debarred from public service, for it is not the public that he--or she--serves. 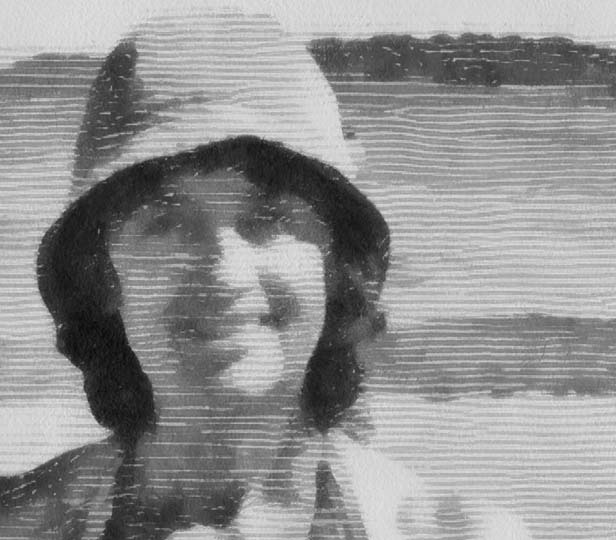 Schooled in psychology and biomedical illustration, of course I became a medical writer! Who the Frack's Really in Charge?